Hooded thugs in Guatemala allegedly beat and set on fire a protester at the Marlin Mine, owned by Goldcorp of Canada. The victim managed to jump into a puddle of water to douse the flames, was rescued by family and taken to hospital where he died. He was indigenous, a Maya Mam. 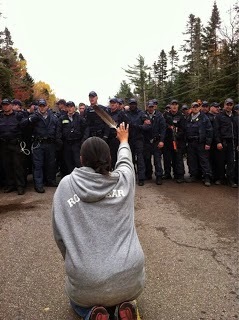 rights urged the government to “properly consult” with the two indigenous communities, to no avail. World Bank International Financial Corporation provided the loan that got the mine underway. Goldcorp said any suggestion that it or its subsidiary, Montana Exploradora which is operating the mine, had anything to do with the violence is “patently false.” After all, their web page says so.